The warrior-hero stretched in the early morning sun, plucking his favorite javelin from among three others. The young boy, still in training, looked on in awe. First made for the brave warrior Orlando who was endlessly complaining that on campaign he always ran out of javelins before he ran out of enemies. This item was made to at least address his concern, though it only slowed his complaints. It appears as a good hardwood javelin with a steel tip which has seen much hard use. The original had Orlando’s name carved into it in a fine hand. Shadowrun continues with one of the players trying to organize/recruit all of the character into his quasi-official Echelon Group, we had two new players who fit in quite well. The latest issue of the Seattle Scream (#35) is available for anyone who has use of such a prop where I actually tie some of the official Shadowrun history into my world with the election results. The last mission was fairly tough but they used a lot of planning, called in some favors and some luck broke their way so they came through without losing anyone but it was close at a few points. They were cautious when it was good to be cautious and acted when they needed to act, nice to see them getting the rhythm of the setting and coming together as a team. The warrior-emperor Hantei Buretsu, twenty-sixth in his line, was discontent with the status quo of the Empire. Everything fit too nicely, each clan fulfilled its duties but nothing really changed. The Emperor dreamt of bringing the benefit of the Empire to those less civilized, and using his talents as a general in the process. To the East was endless Ocean, to the South, the dark and tainted lands of He who Shall not be Named, to the West, desert, but to the North, the lands of the Yobanjin. The Yobanjin, so much like the Rokugani, yet so different. To the Emperor, they obviously needed to be brought into the fold of the Empire and lifted up to a better and more civilized way. For two years, the Emperor prepared soldiers and supplies, scouts were sent North by land and sea mapping the routes forward. Then, led by the Imperial Legions, the armies of the Empire headed into new lands . . . for them and the Great Expedition to the North began. Siriavra, agent of the Light, whispered a prayer as she slide down the silk rope. The cultist were pursuing her and she need to escape from the compound before they were able to seal it. A robed cultist stepped into her way, she dodged left but he was already turning toward her. She send three flare stars spinning toward him, they struck and fulminated into light and fury. The cried of the temporary blinded cultist would bring others, but he would not be able to show them which way she had gone. Siriavra had a lead on them, she knew she must not lose it as she dashed away. 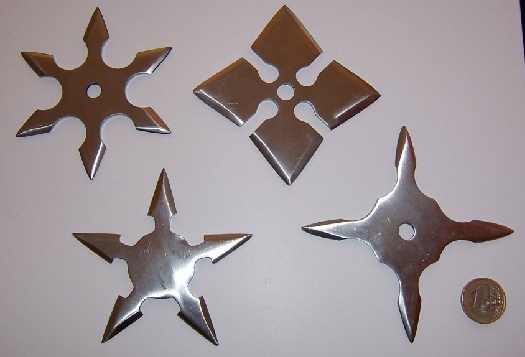 These metal throwing stars, usually five-pointed, are highly polished and occasionally have gold foil applied to them. Those who become or are born Ronin often fall into the orbit of criminal organizations, one such group is the Fraternity of Smoke, a loose network of extortionists, gamblers and other hard men. The Fraternity of Smoke is mobile, seeking opportunities where they may and establishing operations where they can. The symbol of the fraternity is the kiseru, the smoking pipe, which they can turn into a weapon at a moment’s notice. A while back Jeff Rients posed these questions as a spur for thinking about your campaign world. Decided that they might be fun to answer. 1. What is the deal with my cleric’s religion? Just because most of the gods are dead does not mean that faith is gone. There are those that follow the guiding hand of the natural world, other that commune with their ancestors, some that seem to embody abstract principles and even a few that worship the dragons directly (but that is officially discouraged). If you must follow a patron, you can worship the Sun, lord of light and healing, or (if you are willing to risk a horrible death) the Moon, maiden of chaos and mischief. Or, you could adopt the Way. Yes, I started this journal three years ago and since then I have made over 800 posts here. Covering mostly fantasy (and mostly Pathfinder/OGL) with some detours into other genres -especially the superheroic- and I am quite proud of what I have accomplished here and I have every intention of continuing posting resources and inspiring discussion for the foreseeable future. Thank you all for your support and visiting the Sea of Stars with me. As usual, if you have questions or suggestions, please leave them in the comments. You are currently browsing the Sea of Stars RPG Design Journal blog archives for June, 2012.